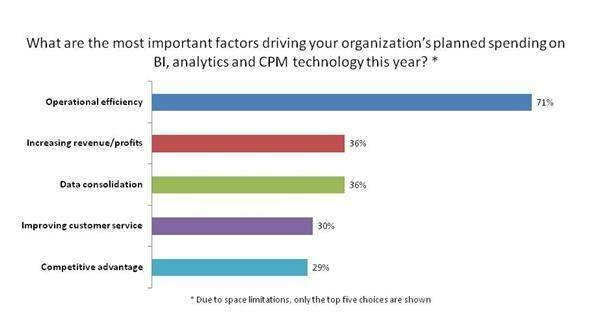 Operational efficiency is the top driver of spending on BI, analytics and CPM technology, a survey shows. Find out where other factors rank in influencing BI tools investments. Operational efficiency is still the primary driver of business intelligence (BI), analytics and corporate performance management (CPM) initiatives in all company size segments, according to the survey. Seventy-one percent of the respondents cited increased efficiency as a key factor influencing their spending plans this year. That was nearly twice as many “yes votes” as any of the other choices received: Increasing revenue and profits and data consolidation tied for second place, with both being identified as spending drivers by 36% of the survey respondents. In order to get more of the benefits of using BI, analytics and CPM tools, and to help justify continued investments in them, more and more organizations are looking to expand beyond basic data warehousing, reporting and data analysis functions. But efforts to expand the BI and analytics process within organizations can take years, according to BI and data warehousing managers who cited a variety of challenges that need to be overcome first. That includes data quality issues, internal IT limitations and the need to wean business users away from spreadsheets and other standalone tools. Demonstrating the potential return on investment (ROI) of BI projects can be a difficult, even exasperating, task. But it’s doable, according to Gartner analyst Bill Hostmann. Get his take on how business intelligence ROI can be more a matter of corporate mindset than hard-dollar calculations. Consultant Rick Sherman says that both business intelligence vendors and BI buyers could do more with less functionality. See why Sherman thinks IT and BI groups that are proposing software purchases should pay more attention to what business users actually need. With its thin profit margins, the retail business isn’t for the faint of heart. But BI technology can make the difference for retail organizations. In a podcast interview, Baseline Consulting’s Jill Dyche discusses how BI software can help retailers retain profitable customers and keep their inventories lean. IT managers and analysts offer five keys to justifying BI investments. First on the list: Collaborate with business users to sell BI and analytics projects and prove their potential value to your organization.